It’s downhill to the weekend folks! I hope you’re having a great week so far! The weather here has been cool and rainy and I really like it. 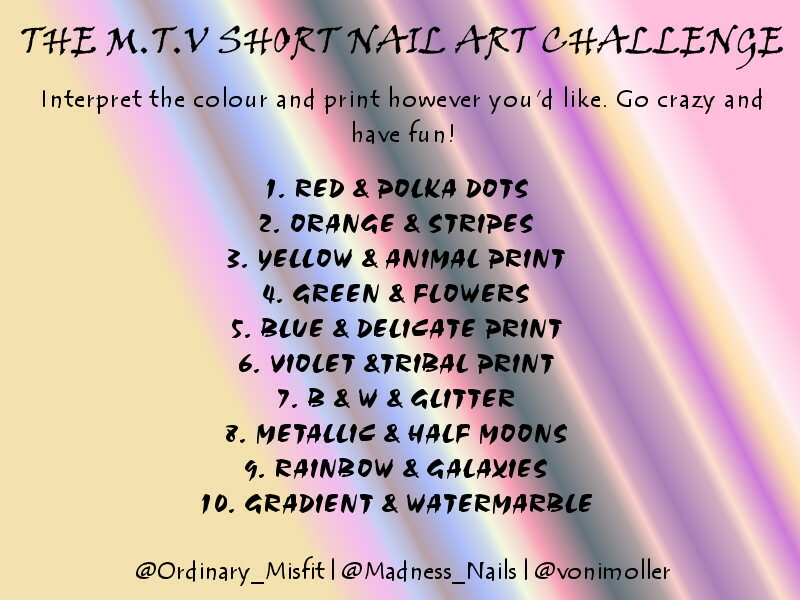 Today is the second topic of the ‘M.T.V’ challenge. If you’re not sure what I am talking about you can head over the my first post and read all about it. Have you decided to join us yet? Todays topic is Orange & Stripes. Seems easy right? 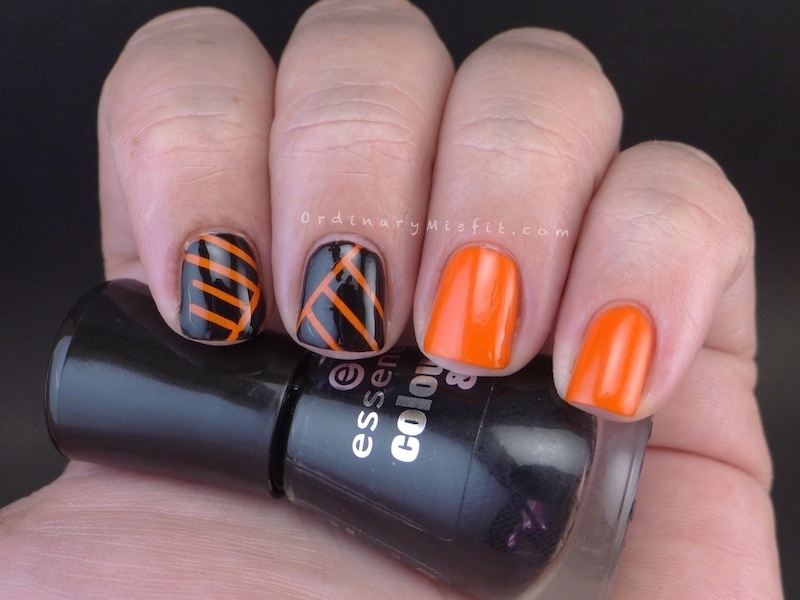 This was one topic I wasn’t over excited about and, well, let me show you my THIRD attempt at Orange & Stripes shall I? 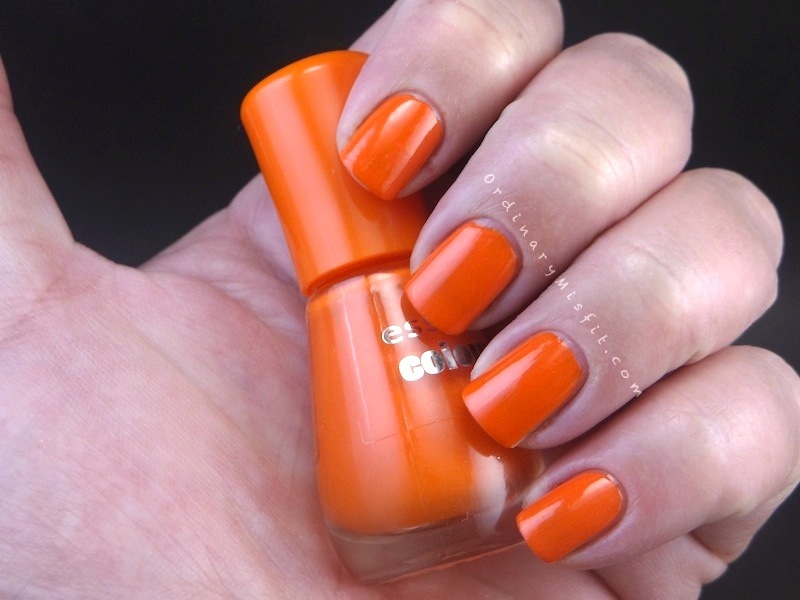 I started off with 2 coats of Essence – Flashy Pumpkin. I then used striping tape and taped off my index and middle finger. I tried to make the the lines on the side of my index different lengths getting shorter closer to the tip. Well, once I added the Essence – Black is Back and removed the tape I realised it didn’t quite work out that way. I didn’t mind though. Like I said this was my third attempt with this topic. What do you think of this? What would you have done for today’s topic? Have you decided to join us yet? If so, leave your link so I can link back to you in future posts as well. In the mean time go check out the other posts for todays topic. 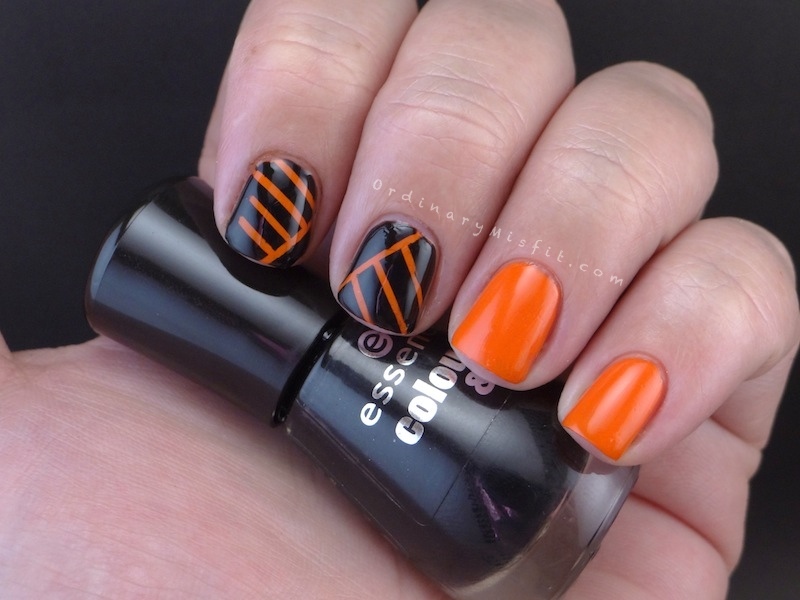 Orange and black always makes me think of Halloween…I really REALLY like Halloween! So I absolutely LOVE this! So much awesome! The orange and black go great together 🙂 I like it! I also like orange and black together. Thanks Kerry! Ja had the same problem with my mani hahaahhahaha that’s why I’m not gona plan them anymore. Ooh I like this, reminds me of a Sci-fi movie or comic I saw once! I decided to join. Just played catch up my Orange & Stripes will be up tomorrow but just posted the Red & Polka dots. I like the name “Flashy Pumpkin,” haha. This is reminding me of Tony the Tiger (from the Frosted Flakes cereal box), for some reason!